How long did ale and beer remain as separate brews? Most* drinkers, I think, know that “ale” was originally the English name for an unhopped fermented malt drink, and beer was the name of the fermented malt drink flavoured with hops, a taste for which was brought to this country from the continental mainland about 1400. Some might be able to tell you that ale and beer then existed alongside each other as separate drinks for some time: but that eventually ale started being brewed with hops as well, and finally any difference between the two drinks disappeared, with “ale” and “beer” becoming synonyms. But when did that happen? I used to think that their merger into synonymity was pretty much complete in Georgian England at the latest, agreeing with the historian WH Chaloner, who wrote in 1960, reviewing Peter Mathias’s great book The brewing industry in England, 1700-1830: “By the end of the seventeenth century the terms ‘ale’ (originally a sweetish, unhopped malt liquor) and the newer ‘beer’ (a bitter, hopped malt liquor) had come to describe more or less identical products following the victory of the latter drink.” But as I read more and more, I slowly realised that this was untrue: that in English, “ale” and “beer” maintained differences through until the 20th century that were, ultimately, from their origins as unhopped and hopped drinks respectively (and nothing to do with the modern American habit of referring to all “top-fermented” beers as “ales”, regardless of their histories and origins). Beer geekery warning: if teasing apart the knotted and tangled threads of brewing history is your bag, stick with me for the next 2,500 words as we range over five centuries of malted liquors and watch meanings mutate: if you’d rather read something contemporary, Rob Sterowski, alias Barm, at I Might Have A Glass of Beer is always an interesting and often a provocative read, and he maintains an excellent list of other beer bloggers as well. Why weren’t stout and porter called ales? This is a reflection, 200 years on, of the origin of porter (and brown stout) in the brown beers made by the beer brewers of London, rivals of the ale brewers for 500 years, ever since immigrants from the Low Countries began brewing in England with hops. This ale seems to have been brown ale (and the beer brown beer), for Poundage says that it was the gentry, “now residing in London more than they had done in former times”, who “introduced the pale ale, and the pale small beer they were habituated to in the country; and either engaged some of their friends, or the London brewers to make for them these kinds of drinks.” The pale ale “was sold by the victualler at 4d per quart and under the name of two-penny.” It was the need to counter the success of this pale ale that “excited the brown beer trade to produce, if possible, a better sort of commodity, in their way, than heretofore had been made”, an effort that “succeeded beyond expectation” with the development of what became known as porter, because of its popularity with London’s many street porters. But while the “brown beer trade” developed into the porter brewers, the ale brewers continued to find a market. “For strong brown ale brewed in any of the winter months and boiled an hour, one pound is but barely sufficient for a hogshead, if it be tapped in three weeks or a month. If for pale ale brewed at that time, and for that age, one pound and a quarter of hops; but if these ales are brewed in any of the summer months there should be more hops allowed. which if my very poor German is correct, translates as “a mixture of unhopped and hopped beers, in which the taste of the ale predominates.” “Ale” the Wörterbuch translated as “susses, ungehopftes Bier“, sweet, unhopped beer. Later, in the first part of the 19th century ale was mixed with porter, to make a “half-and-half” that would be stronger than porter on its own. Ale is of a lighter colour; it is stronger, sweeter and is less hopped than porter. The development of a well-hopped light-coloured malt liquor that went by the name pale ale was an important step in the merging of meaning for ale and beer. By the 1850s, “pale ale” and “bitter beer” were true synonyms (though, puzzlingly, mild ale evidently continued to be pale). But another step was the disappearance of ale and beer brewing as operations conducted by different sets of firms. The separation of ale brewers and beer brewers dates from the first arrival of hopped beer in England, and in London many brewers carried on being either ale specialists or beer specialists, even when ale started to contain hops. The popularity of porter had meant that the biggest beer, or porter brewers had grown vastly larger than the biggest ale brewers. Even as late as the second decade of the 19th century, the ale brewers and the porter, or beer brewers of London were carefully distinguished, as this (fascinating) table from the Edinburgh Review from 1813 shows. This may be because the excise authorities, when calculating rebates on the malt tax, evidently measured the output of the porter brewers in the beer barrel, of 36 gallons, and the ale brewers’ output in the ale barrel, of 32 gallons, sizes laid down in an Act of Parliament dating back to Henry VIII. 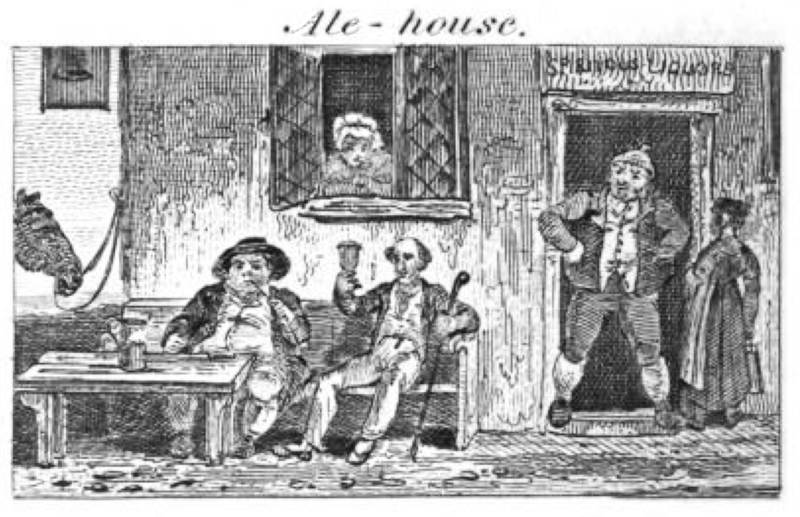 From the 1820s onwards ale – sweet London ale, sold unaged, or mild, not the well-hopped variety exported to India – finally began to grow in popularity relative to porter. In 1833, a brewer from Nine Elms, South London, Mr Farren, told a House of Commons select committee investigating the effects of the Beer House Act, introduced three years, that there had been a “revolution” in the trade generally, and that Barclay and Perkins, and the other great porter brewers, seeing porter consumption drop and ale consumption rise in its stead, “have gone into the ale trade; nearly all the new trade is composed of mild ale”. From this time, as the porter beer brewers began brewing mild ale to make up for falling sales of their previous pride and joy, the categorisation of London’s biggest malt liquor makers into either porter brewers or ale brewers rapidly seems to disappear. at present ‘beer’ is in the trade the generic name for all malt liquors, ‘ale’ being specifically applied to the paler coloured kinds, the malt for which has not been roasted or burnt; but the popular application of the two words varies in different localities. Such general terms as ale, porter etc … cannot by their nature have any solid ‘correct’ definition over all time and space, in spite of the efforts of various prescriptive authorities. * edit: all right, “some”. I have yet to read the entire article (look forward to it when I find time) but just wanted to say that even as recent as last year, an Irish friend corrected my statement that stout is an ale. So, at least in County Sligo, the thought persists that ale and stout are separate types of malt liquor. To a certain extent, the difference between ale, porter and beer exist to this day in certain official documents. Earlier this year a European Union court has rejected AB-InBev appeal to use Budweiser as a registered trademark in the EU, backing the clain of Czech Budějovický Budvar. The text of the ruling says that that the multinational monster will not be able to use the Budweiser brand for the following products: Beers, ales, porters and alcoholic and non-alcoholic malt drinks. * any liquor which is made or sold as a description of beer or as a substitute for beer, whose alcoholic strength exceeds 0.5% ABV. * This includes mixtures of beer with non-alcoholic drinks, (for example, with lemonade to produce shandy). Also classified as beer for duty purposes are certain mixtures of beer with alcoholic liquors or substances where the final product strength does not exceed 5.5% ABV – see section 19. The description does not include black beer made from worts at a gravity of 1200 degrees or more before fermentation. Not sure what black beers of a gravity 1200 are out there but I want some. I suspect “black beer made from worts at a gravity of 1200 degrees or more” may be referring to brews such as Mather’s Black Beer, the Yorkshire speciality. More interestingly, if the old ales (without hops) were brewed now what would they be called since calling an ale would be confusing to pretty much everyone. Question is: do you know of any drinkable “ales” that meet the original classification, chiefly to serve as an example? In France they don’t have that problem, since cervoise still means unhopped malt liquor, and bière is reserved for the hopped stuff. Meanwhile in German, bier covers both glasses of drink. You flatter me, sir. But I find it fascinating that despite the radical difference between modern mild and bitter and their ancestors, it is still possible to trace the line back to the 15th century and see how they have co-existed for so long. Some important history well-limned, with opinions I cannot much disagree with. The very term porter may derive from the term “porter’s ale” (to which there are numerous references in 1700’s sources). Thus, the linking of those two terms seems to go back a long way. In more recent decades, Michael Jackson wrote in his first books that porter and stout were species of ale. In stating this, he was focusing on their top-fermentation character. Since London brown ale (e.g., stitch) seems part of the story of porter – porter before it was hopped more, when it was still a mix – his theory makes sense to me. Anyhow, the American habit to call any top-fermented beer “ale” is an example of Jackson’s extensive influence on recent beer culture here. By recent I mean since about 1980. Before the 1980’s, beer in American meant only lager, and ale meant the few remaining top-fermented (or hybrid cream ale and such) beers. Beer now means any kind of beer, much as in England. I recall in the 1980’s, beer in England did not generally denote lager (thus the exact reverse of the older American practice). That has changed as you noted, Martyn. Gary, if there are “numerous” references in 1700’s sources to “porter’s ale”, Google Books can’t find more than five or six of them, and none of them, as far as I can see, are from people who would necessarily know what they were talking about as far as the difference between ale and beer were concerned. I stand in the front row of admirers for Michael Jackson, his writings and what he did for appreciation of beer, and it made me hugely proud when he namechecked me in one of his books, but he wasn’t a beer historian, and certainly when he was writing his first books he had no reason to think that it might not be right to call porter an ale: neither did anybody else, and I’ve only properly come to that conclusion myself in the past few years, as I’ve read more and more old texts. I wouldn’t be surprised at all if somewhere in Beer: The Story of the Pint, which I finished in 2002, I call porter an ale. I wouldn’t now. As for London brown ale, I’m confident it’s not part of the porter story, which is descended instead from London brown beer. However, because later writers (including me, to begin with) didn’t understand the importance of distinguishing between ale and beer in 18th century texts, then Stitch, or strong brown ale, was dragged in as an ancestor of brown stout. But if you read the London and Country Brewer, William Ellis makes it clear that Stitch was only lightly hopped, was weaker than brown stout, and was firmly part of the ale family, not the beer family. So Stitch is nothing to do with stout porter. You can all call anything fermented with top-settling yeasts “ale” if you like, as long as you are prepared to put up with the dirty looks and mutterings from over this side of the Atlantic. It doesn’t ultimately matter: what is real is whether what’s in the pot tastes any good, not what it’s called. To further muddle the issue here in the US, some states require that a malt beverage over a certain abv (typically 6%) be labeled “ale.” This is a historic artifact dating back to probably the 19th century, when ales were indeed stronger, for the most part, than lagers. With the repeal of prohibition in 1933, many strange laws were written. This has led, among other things, to the peculiar label I found in Texas a few years ago of Salvator Doppelbock Ale. Well, Michael’s schema was certainly his own, partly of course inspired by history, partly by his own thinking, partly by his artistry – idiosyncratic in a word. And as always, he was mainly concerned to explain and categorize beer in his day. I was simply seeking to show why, in my view, many North American craft brewers and beer writers speak of beers in the terms he did: his influence was very considerable here. As to porter’s ale, well, clearly it was used in a popular sense by some in the 1700’s. Certainly ale and porter, until pale ale as you explained earlier, were technically separate. Undoubtedly porter is beer, not ale. Still, I can’t rule out that one of the mixtures porter was felt to improve on was brown ale and brown beer. Poundage speaks of a number of mixtures which might have included this. I am first to stand shoulders with those who put taste first. Classification is important, but can never be completely resolved due to general and early use in numerous contexts of terms such as ale, beer, porter, entire. The quotation you gave to this effect above cannot be improved on in my view. Martyn, I was just looking at Richardson (I don’t have the book but found extracts online). He states that all beers are of the “genus” “malt liquors” or “beer”, i.e., he acknowledges that the term beer is used loosely in this sense. Then he subdivides the genus into “porter”, “amber”, “ale”, and “beer”. He indicates in parentheses that his second use of the term beer has a more restricted sense. I find his taxonomy interesting and I think it is based both on colour and hop content. Amber would be amber-coloured but otherwise a form of beer. He doesn’t sub-divide further, but that is how I parse it. Porter ditto except dark-coloured. Ale as he knew it was, in my view, light-coloured and so was beer. E.g., Combrune’s “pale small keeping beer” was pale, so was October beer or March beer, at least typically. Once porter became an established style, and factoring its colour, it became (again I apprehend) a sub-genus on its own. Poundage’s “brown beer brewers” were making a form of beer I would regard as originally atypical: it used high-dried malts. Ditto the brown ale that emerged in London and I believe elsewhere also made with similar malt. I think one interpretation is that the mixtures of these and sometimes other beers were supplanted (not completely to be sure) with porter, a “beer” due to its hopping even when sold mild. The question I find really interesting is, did porter emerge as an answer to inadequate mixed beers? Feltham suggests this, and you can read Poundage that way too I think. Or did porter emerge as an improved brown beer only with no reference to the mixed drinks? If the latter happened, perhaps Poundage mentioned the mixtures just to indicate what people were drinking at the time. It gets confusing because popular terminology was probably imprecise. Was porter’s ale only brown beer? Was “porter’s liquors” ditto? Or were porters possibly devotees of a broad number of drinks, brown ale and brown beer mainly, of which only brown beer was responsible for the development of porter? Those are much the same questions I ask myself, Gary. Sadly, there’s very little evidence available. I think you’re probably right in your interpretation of Richardson. As for porter and its relation to early mixed drinks, I’m inclined to feel, from what I’ve read, that despite what Feltham says, it wasn’t a replacement for three-threads or any mixed drink, but for London brown beer. There’s no good evidence as to what three-threads was anyway: I have only found two other references to “three-threads” apart from Poundage and all those derived from Feltham, and neither gives any clue as to what it consisted of. By the end of the 18th century I think we can be fairly safe in saying that porter was often (?usually?) served as a mixed drink, “mild” and “stale” from different casks poured into the same pot, but what was going on in the earliest period it’s hard to say. A small, and completely anecdotal, contribution to the porter/ale debate. Popping into a local pub this afternoon, I glanced at the sign above the door – not something I’ve ever bothered to do before. It reads “X, licensed to sell wines, spirits, ales, stout and cider”, with the current landlord’s name tacked on the top . I’m not sure how old the sign is but it looks pretty weather-beaten. The pub itself is early nineteenth century. Its wording is clearly based on the licensing laws when it was written and I think shows a clear distinction between (stout) porter and ale at that time. I’m sorry to comment on an entry so long after you wrote it but I found it only now when trying to find differentiations between beer and ale that so many authors seem to assume without any sort of evidence. My current research is in medieval Scottish beers (c1250-1550 as of now), but my personal roots in the understanding of beer come from my interest in craft beers in the US (So I’m someone who has always referred to all top-fermenting beers as ales… it’s just how I learned it.). So once again thank you for this. It does clear up a lot that books I’ve read seem to assume I know and that I didn’t get helped with when I’ve directly asked about the beer/ale divide. I’m trying to get as close as I can to 16th century, or earlier, sources. The 19th century commentary by those who were transcribing earlier documents seemed to me to be making the distinction arbitrarily and it’s good to know that it does have roots and that I simply didn’t know them. Glad to help, Stephanie. I’d be very interested to hear the results of your researches, and I know others who would be as well. I too am a late comer on this subject but, I tend to agree with Doctor Summers that terms like ale and porter don’t really have set definitions over time. I also think there may be some distinctions between how these terms were used by professional brewers and the home brewers and the general public during the 18th century. There seems to be some indication that ale was used to indicate stronger malt liquors and beer the weaker ones or ale for first running’s and beer for the second and third in home situations. There are some exceptions to this such as strong October beer but, I think that alcoholic strength also was a factor in many peoples use of the terms during the period. Shaun Whitfield on When did ‘bitter’ become the beer style that dare not speak its name?